Philadelphia firefighters battled a fire at a vacant building in Manayunk on Sunday afternoon. It started around 3:30 p.m. near Main Street and Leverington Avenue. The building used to house the former Carmella's Restaurant which closed in 2004. The vacant building is located on Venice Island between the Manayunk Canal and the Schuylkill River. 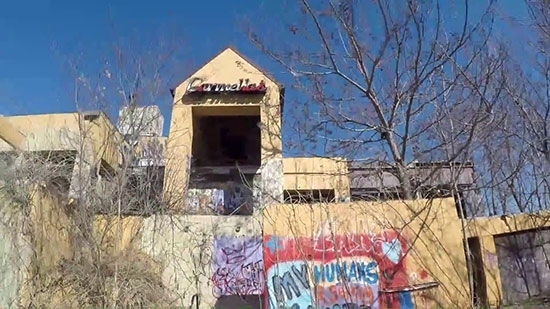 The building itself has become popular with graffiti artists and urban explorers. The fire was brought under control by 4:24 p.m. Main Street was already closed about a block away for the StrEAT Festival and fire activity closed portions of Leverington which caused traffic problems. The cause of the fire is under investigation. A man was shot an killed in Vineland, NJ in a drive-by shooting on Sunday afternoon. A Millville man was walking along Chestnut Avenue near Myrtle Street around 1:30 p.m. when a gunman opened fire. The victim ran into a backyard where he died. The suspect's vehicle is described as a dark-colored sedan. The identity of the victim has not been released. The investigation is ongoing. Anyone with information is asked to contact Vineland police. A fire in an Upper Darby apartment building has left dozens displaced and sent one police officer to the hospital. It happened just after 11:30 a.m. at the Way-Lin Manor Apartments at 2020 Garrett Road. It started on the first floor and made it hard for people on the upper floors to escape. Emergency responders were able to get everyone out of the building safely. One Upper Darby police officer was sent to the hospital to be treated for smoke inhalation. The Red Cross is helping around 50 residents that have been displaced. Firefighters are investigating the cause.